One of my main objectives when I work with athletes is to help them deeply engage in the “process.” Most athletes understand the concept of an outcome focus vs. a process focus by now. However, actually doing it, committing to a particular process, regardless of the outcome is far from easy. There is a big difference between practice and competition. Everybody knows this. The key is to learn how to perform as well in competition, even better, than you do in practice. The best athletes in the world do. How? They are deeply committed to what they are doing in the moment. They have an acute awareness that if they do what they have trained the outcome will be there. They are willing to make mistakes as long as they play the right way, the way they have trained. They understand that they will not reach their potential, that they will lose, if they don’t execute their plan. This commitment, this intention is one of the main things that separates pros from amateurs. Most amateurs are not willing to go out of their comfort zone. They fear mistakes, losing and what people might say if they lose. I understand how overwhelming this mindset can be. I know it is a strong current of external approval that is always sweeping by ready to take you down the river of “win at all costs.” The mind may be saying “process” but the body is saying, “How about we ‘let it go’ tomorrow? Just let me get the ball back this game and maybe my opponent will choke and give it to me.” Here’s the problem: Sometimes they do and you are rewarded. 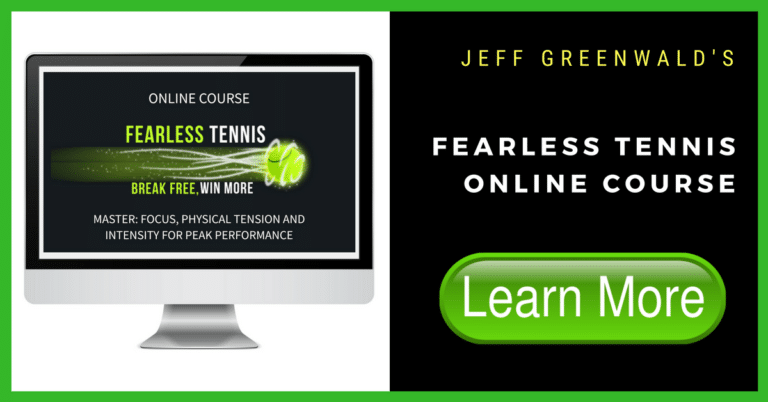 And, while you may have won the point, the game or even the match, you will be even less likely to hit through the ball next time. Your brain will bargain with you in the next match as you face this DECISION. People on the street, who are completely addicted to drugs and have lost everything are often still unwilling to change their habits. They are comfortable being uncomfortable and, while they have plenty of reasons that a change would be good for them, they won’t do it. The comfort zone is very safe. But it is the caccoon of mediocrity, perhaps even long-term failure. You know you won’t reach your potential playing it safe. Or, perhaps you are still in denial. But, if you take an honest look at how you feel when you hold back and really assess how much better you play when you let it go, you will be one step further along the continuum to playing this game on your terms. The outcome is compelling and may trap you into putting off the challenge we all face: To swing with freedom regardless of the score. If you make this choice, commit to it with a smile that says, “I’m not falling for it. This is my time. I play on my terms,” just maybe you will get to experience the joy of playing with freedom. And watch the wins pile up without the same attachment. Trust me, it’s possible.